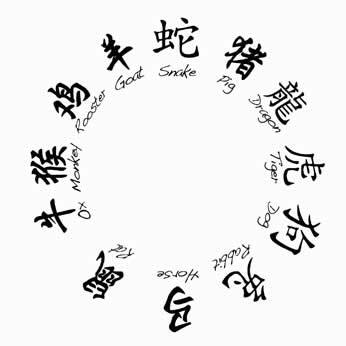 Like Western Astrology, Chinese horoscope too has twelve zodiac signs. The Chinese horoscope is based on a twelve-year cycle and each year is represented by an animal. You do not need to know the exact time and date of your birth to build your horoscope. Just the year of your birth is sufficient to determine your horoscope sign. The animals representing the Chinese astrology signs have certain mental, intellectual and physical characteristics and like the zodiac signs in the Western horoscope, they influence the persons born under their signs. Each element makes its own contribution to the total influence of each animal sign. Besides these, there are two other forces of nature whose significance in influencing the life, prosperity and health of human beings is being widely recognized the world over. These forces are Yin and Yang. While Yin represents a passive and yet a receptive female energy, Yang is the aggressive and adventurous male energy. It must also be noted that these two vital energies are complementary rather than antithetical to each other. A healthy and harmonious balance between the two forces can go a long way in contributing to the overall welfare of the human beings, organizations, events, and places. Each animal sign possesses certain interesting traits. You will certainly begin to appreciate them to know their contribution in determining the traits and future of the human personality. Take for example the case of first animal sign, the rat. We usually associate rat with a creature that nibbles away our food, clothing, papers, books and spreads plague. But according to the Chinese horoscope, there are many unique characteristics associated with the rat. The rat is supposed to be very imaginative, charming, protective, compassionate, communicative, dynamic, familial, thrifty, skillful, sober, upright, attractive, idealistic, prosperous, experimental, talented, adaptable, open-minded, brilliant entrepreneur and generous creature. Those who are born under this sign obviously imbibe these enviable qualities of head and heart. Similar is the case with other animals and their characteristics. The Chinese people have also developed their own kind of astrology. To find out more about this ancient astrology please click on Chinese Astrology.